Don’t get me wrong. I am a big believer in Social Enterprise or Enterprise 2.0 (or the puzzling phrase 'Facebook for the Enterprise'), a concept heavily promoted by the likes of IBM, Salesforce.com, InformationWeek, Yammer etc. However, as a practitioner, I always felt there are some fundamental behavioral and structural differences between the ‘consumer social’ and the ‘work social’ worlds, even without getting into the universally understood challenges such as security, data privacy, tool features etc. Lack of mutual self-interest: Real collaboration is through strong individual motivation and mutual self-interest, not by a corporate edict (‘thou shalt collaborate’). In your company, if people do not regularly make new connections without a pressing need, even over lunch, interaction without a concrete short-term reason is unlikely or not sustainable. Aligned self-interest is hard to establish without personal relationship and trust. Hence, social interaction might work for deep existing relationships, but not for new casual ones (or 'weak ties'), lowering the allure of ‘click and collaborate’. Maslow's hierarchy of needs: Most people work to pay bills and the goal is to get the job done as quickly as possible. 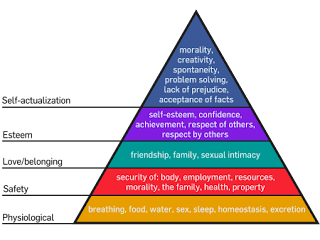 Work is at the lower levels of the Maslow's pyramid (safety/ employment), whereas in online social networks, people just want to ‘waste time’ building a connection and empathizing, in the esteem/ self-actualization levels. You may have a few good friends at work, but it’s not the same as wading through tons of status feed from relative strangers at work at 10pm. Network effects: might be the biggest barrier to adoption. Metcalfe’s Law sounds great, but also means that the value kicks in only at critical mass. Otherwise, you go there once or twice, but have no reason to revisit and slowly forget or give up. There’s an interesting paradox – the smaller and specific the network is, the more valuable it is for the employee (self-interest and relevance at critical mass), but the greater and general purpose the network is, the more valuable it is for the company (IT investments, streamlining, ROI etc), making it challenging to merge the two motivations. There’s also a ‘chicken and egg’ problem in network, as it is hard to migrate everyone to a new tool, but also less valuable if everyone is not on the same tool. Facebook famously and brilliantly solved the network problem by going after college after college, giving exclusivity and relevance per each network, but it continues to be hard for enterprises, especially due to the challenge of reaching critical mass in multiple sub-networks. Different online habits: People vary widely in their communication preferences (e.g., email vs. in-person) by personality, nationality, culture, age etc. Most executives & business people prefer verbal communication, even if they claim to be 'social'. Many employees do not feel comfortable in openly debating complex issues electronically, for the (legitimate) fear of misinterpretation. You cannot stay anonymous in an internal network, raising the stakes. You have to be naïve or rationally risk-seeking (e.g., people in satellite offices) to engage in company-wide (or even org-wide) open discussion on sensitive topics. No ‘Ashton Kutcher’ prize: Every company already has one – its CEO. The charisma of people in an enterprise is mostly determined by the organizational structure rather than follower count or social activity. There’s a clear pecking order as to whose opinion is more important, even more in a hierarchical organization (like the Orwell quote: “All animals are equal, but some are more equal than others!”) Investing in internal social tools for increasing influence is hardly worth the effort, unlike the ‘people social’ world, where the Google VP in Egypt or grass-root Twitter activists could become instant celebrities. Clearly, flatter and democratic organizations will be the future norm, but it’ll take some time. Does it mean Social Enterprise is a fad? Absolutely not. There are clearly select classes of enterprise business problems, cut out for social tools, I feel. Hope to discuss that in a later post. Why do you think consumer social-like behavior does not easily translate to enterprise? P.S Is this ‘Facebook in the enterprise’?